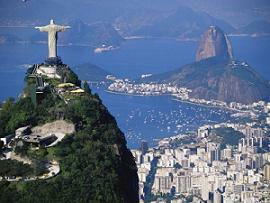 TO MOST PEOPLE the continents of North and South America are not immediately associated with the martial arts.On closer inspection, however the region reveals iteself as a cultural melting pot in which vibrant, indigenous, tribal fighting methods stand side-by-side with martial arts traditions from Europe and Asia. Central and North America's most popular martial arts are hybrid systems that have emerged through the continual evolution and amalgamation of indigenous and imported systems. MARTIAL ARTS have become an increasingly essential part of the fabric of modern, urban society in many corners of North, Central, and South America. 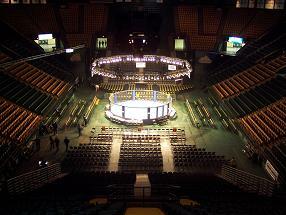 This has been encouraged by the demands of live TV broadcasts that have turned some arts into sports watched by millions—for example, the spectacular Mixed-Martial-Arts (MMA) competitions of the Ultimate Fighting Championships (UFC). Movies, too, have popularized other arts among younger generations eager to learn self-defense techniques or to imitate their screen heroes. The early martial arts of the Americas emerged among the communities of African slaves who brought their fighting and dancing skills to Brazil and the Caribbean. 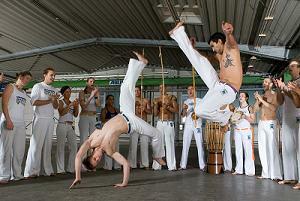 They created martial arts such as capoeira , which involves a multitude of powerful punches, kicks, and head butts. Capoeira was outlawed, but the slaves continued to practice their art under the guise of music and dance performances—the blows were disguised among hypnotic dance movements. Slave communities also created mani stick fighting in Cuba and calinda in the Caribbean and New Orleans, and these were also fought with a musical accompaniment, often at festivals and carnivals. The no-holds-barred wrestling matches of Brazilian vale tudo and Brazilian jujutsu are forerunners of mixed martial arts, which saw a huge surge in popularity in the early 1990s. All these systems have left an indelible imprint on the martial-arts landscape in the Americas. Perhaps the best example of the hybrid influences that distinguish a truly American martial art is Jeet Kune Do. The legendary martial-arts movie star Bruce Lee, who was born in San Francisco and raised in Hong Kong, developed this system from techniques of Chinese wing chun, Japanese judo, Western boxing, European fencing, and Filipino arts. Lee drew on philosophies from around the world to express his thinking. His innovative martial-arts training program was modern and scientific and emphasized the practical value of nonclassical and traditional routines. The US culture of freedom, creativity, and a can-do attitude no doubt played a large part in shaping his thinking. Lee’s legacy also includes a number of hugely successful movies, almost all of which highlight his exceptional physical conditioning and martial-arts prowess. The proud martial tradition in America extends from collegiate wrestling, which is largely based on catch wrestling from Europe, to the kickboxing phenomena of the 1970s and 80s that transformed the public perception of martial arts. 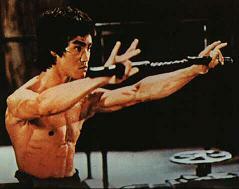 Other examples include lua, a unique and exotic combat art from Hawaii, and American kempo, which is based on Chinese fighting methods but has a purely English-language syllabus, is taught in an American cultural context, and was popular with celebrities such as Elvis Presley. The success of martial arts in the Americas has extended to the military, security services, and police, all of whom have recognized the benefits of martial techniques in their field of work. The US armed forces have extensively researched and developed a number of noteworthy combat systems. For example, two highly codified, close-quarter combat systems—the Marine Corps Martial Arts Program and the LINE system—are specifically designed for teaching recruits in a limited time-frame and to maximum effect.